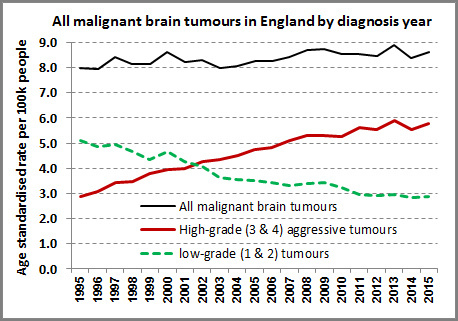 Philips provided the graph below which shows how the total number of malignant brain tumors (black line) has remained fairly steady, concealing the increase in GBM (red line). Philips and coworkers do not know what is causing the increase in GBM, but they reject improved diagnosis because these tumors are generally fatal and are very rarely missed. “We suggest that widespread environmental or lifestyle factors may be responsible,” they write. One possible factor is the widespread use of cell phones. Philips also raises the possibility that an increased exposure to X-rays from CT scans might be contributing to the higher rates of GBM. What’s Going On in the U.S.? In 2012, a group at the University of Southern California reported an increase in GBM in the frontal and temporal lobes in the U.S. 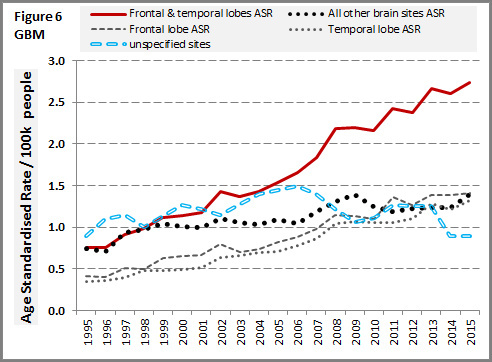 But, a more recent analysis by the Central Brain Tumor Registry of the United States did not show a rise in GBM from 2000-2014 (Fig. 25). The CBTRUS study did not look at tumor location. Why there would be a difference in the incidence of GBM between England and America is not clear. Joel Moskowitz of the Berkeley School of Public Health agrees that the issue needs more attention. “Those who cite statistics that appear to show a flat-line trend in overall brain tumor incidence and argue that cell phone use doesn’t cause brain cancer need to examine data on the location and type of brain tumors over time,” he said. Philips too wants more work to be done. “Our results highlight an urgent need for funding more research into the initiation and promotion of GBM tumors,” he and his coworkers argue in their new paper. Philips is a trustee of Children with Cancer UK, a British charity. He is also the founder of PowerWatch, an activist group that has long urged precautionary policies for radiation exposure. Denis Henshaw, the second author of the new paper, is the scientific director of the cancer charity and a professor emeritus at the University of Bristol. Children with Cancer had no direct role in this study, Henshaw said. Philips has been working on this analysis for the last seven years, without any outside funding. He himself paid for the data from the U.K. Office of National Statistics. His findings beg the question: Why didn’t anyone else, notably an epidemiologist, detect this trend in rising GBM? Henshaw commented that their findings illustrate the need to look more carefully at —and to try and explain the mechanisms behind— brain tumor trends. “You should always keep your eye out for the unexpected,” he told us. Final version of the paper by Philips and coworkers has now been published. Available here. They have also added a letter which argues that GBM rates may be increasing in the U.S. too.